Craving a hearty breakfast with some of your favorite ingredients in a new form? 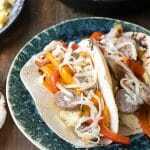 Sausage and Peppers Breakfast Tacos are stuffed with fluffly scrambled eggs, savory breakfast sausage slices, sautéed sweet pepper and onions, topped with smoked cheese in a warm corn tortilla. Hungry now? This hearty breakfast recipe is sponsored by Mulay’s Sausage, purveyor of fine sausages made from centuries old family recipes. All opinions are my own. My culinary wheels are always spinning in an effort to dream up new, unexpected ideas for a hearty breakfast. The standard cold breakfast foods are droll to my palate and I never am left feeling fired up with energy unless I have some protein. I love savory flavors, and warm foods that satisfy my palate as well as my stomach. 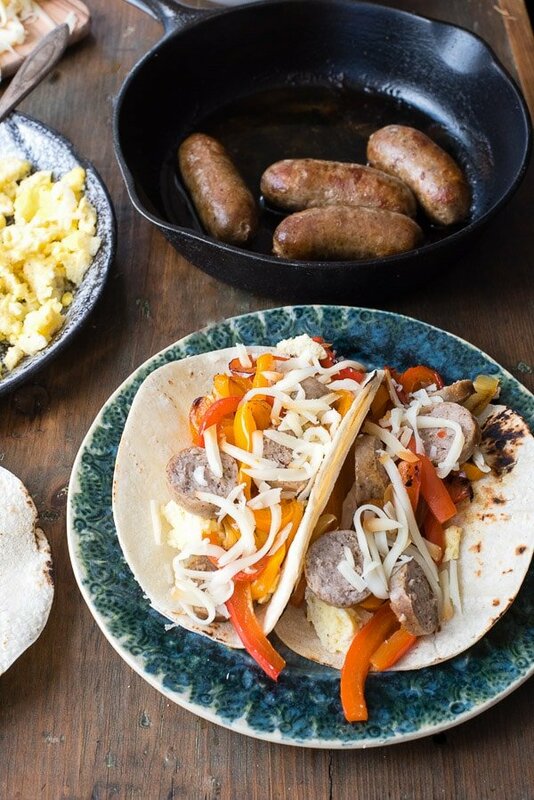 I’m sharing my latest favorite today, Sausage and Peppers Breakfast Tacos, along with a new best friend I know you’ll want to meet! Tacos to me are a food that could (and should) be eaten any time of the day. 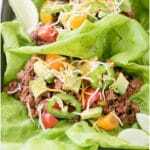 Liberal interpretations abound so if you enjoy a classic beef taco, so be it, but you don’t need to stop there. 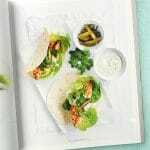 I feel tacos offer the opportunity to mix and match favorite ingredients on a whim, sort of like a trip to an ample salad bar. Piece together what sounds great and there are no wrong combinations! When I think of weekend breakfasts, cooked eggs, home fries and meat come to mind. I love home fries whipped up with lively bell peppers and onions. They elevate the potatoes and add some sassy color to what can be a tone-on-tone plate. I love a lively visual plate and even when cooked, peppers add some texture I find essential to breakfast satisfaction. 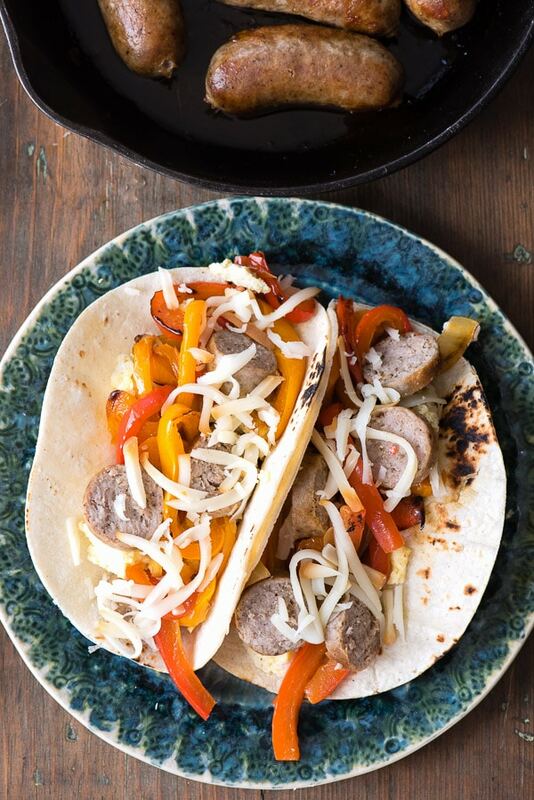 Today’s Sausage and Peppers Breakfast Tacos was sort of built as an homage to my new favorite breakfast sausage from a local sausage purveyor, Mulay’s Sausage. They are a newer friend but one that I’m sure will be in my refrigerator for a good long time. I’ll confess, I did not think that sausages of the same type really could be differentiated radically from one maker to another. I learned I was grossly mistaken (and my family will agree fully). Mulay’s Sausages have a beautiful, and heartwarming lineage dating back centuries to Italy. Ironically the inspiration for making their Italian Hot Sausage was from a 1990 visit to family in New York where at a local festival everyone was boasting sausage, pepper, and onion sandwiches; the Mulays left sure they could make better Italian sausages. Ironically I did not learn this until after making my Sausage and Peppers Breakfast Tacos, which are seemingly an unconscious homage to the Mulays! Usually when speaking about a food, it’s what IS in it that is the focus. These sausages are no different boasting delicious antibiotic free pork. However, it’s what isn’t in the sausages that becomes the allure. 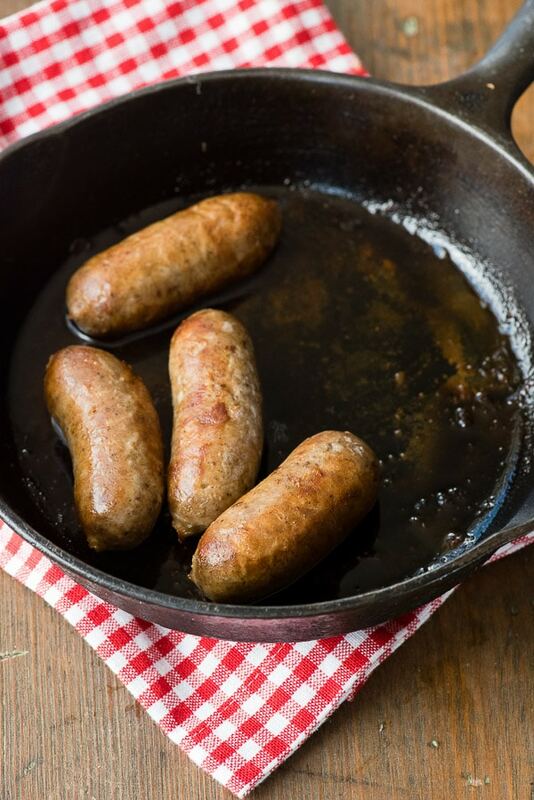 Mulay’s Sausages are certified gluten-free, no sugar, no dairy, no nitrates, are certified paleo-friendly, and most importantly, taste so darn good. No artificial colorings, no artificial sweeteners or artificial preservatives. They are real food. I tried some of their Mild Italian Sausage and immediately noticed the vibrant combination of flavors that taste so fresh and authentic. The casings yield to the bite (no wrestling like playing tug-o-war with a dog to bite through them). It was a family epiphany around my dinner table with every family member declaring their new love. With this ode to sausage as a backdrop, creating a breakfast taco showcasing Mulay’s Breakfast Sausage links was obvious. 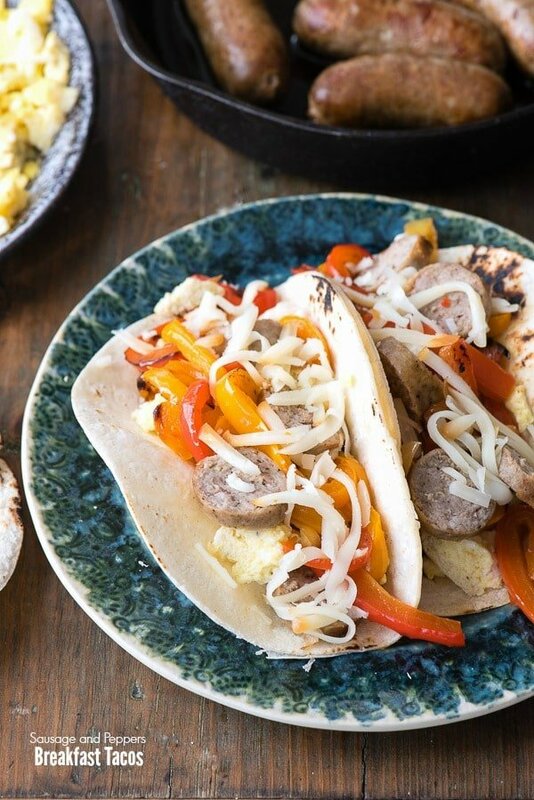 A soulful bite of these hearty tacos will start your day off right with fluffy scrambled eggs, sautéed peppers and onions, slices of breakfast link sausage and a sprinkling of smoked provolone cheese. Those loving a kick can add a few hits of Sriracha! Onion lovers will want some Quick Pickled Red Onions on these breakfast tacos too! These hearty breakfast tacos are bursting with color, flavor and texture to start the day off right. 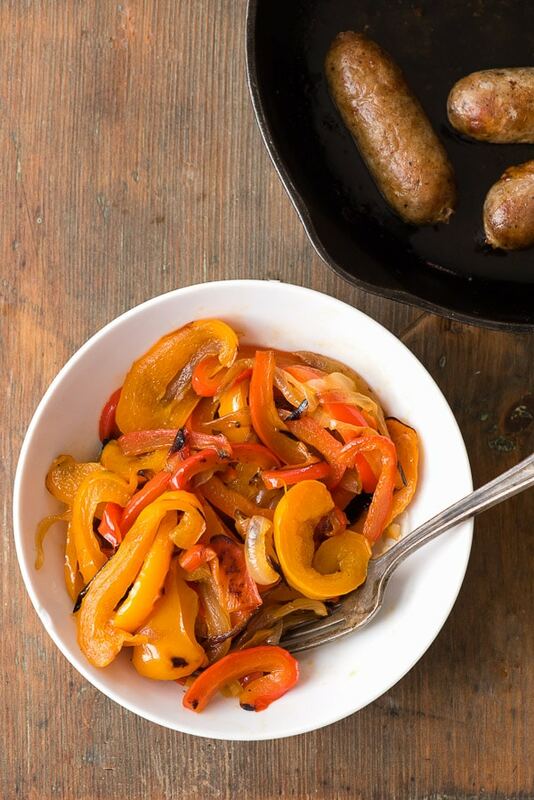 To streamline the cooking process, making the peppers and onions at the same time as the sausages is easy and manageable. Corn tortillas are warmed in the microwave (although they can be warmed and softened in a dry skillet on the stove top too). The scrambled eggs are made last so they are fluffy and hot when making the tacos. In a large skillet with a lid, heat the olive oil on medium-high heat. When the surface of the oil is shimmering add the pepper and onion strips and sauté until onions are translucent and peppers become limp; about 10 minutes. Tip: after sautéing for a few minutes, add the lid to the skillet stir the mixture ever few minutes. It will speed up the cooking and develop a nice char on the peppers. At the same time the onions and peppers are cooking, add ¼ cup water and the sausage links to a heavy, medium-size skillet over medium-high heat. Cook until the water evaporates (around 7 minutes). Reduce the heat to medium and continue to brown the sausages, turning them to brown on all sides (7 minutes). Sausages are done when their juices run clear and their internal temperature reaches 160 degrees. Remove from skillet and set aside. Once cooled briefly slice into ¼-inch slices. Wrap tortillas in a damp paper towel and microwave for 15 seconds. Crack the eggs into a large mixing bowl. Add the milk, salt and pepper and whisk to fully combine. Heat the butter in a large non-stick skillet over medium-high heat. Pour in the egg mixture and allow the eggs to begin to set; stir the eggs allowing small pieces to form. Repeat, allowing the eggs to cook and stir until no liquid is remaining. Remove from heat to serve immediately. 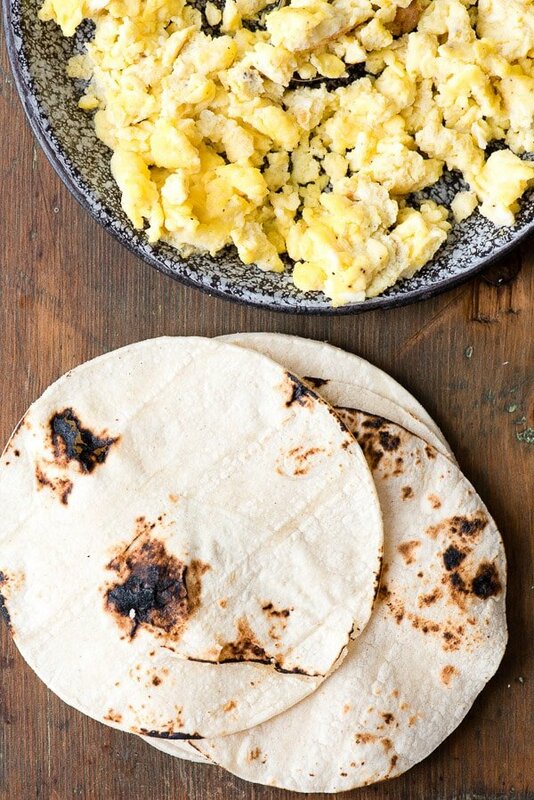 To make tacos: Equally divide the scrambled eggs adding them to the middle of a warmed tortillas. Layer with the pepper and onions, slices of sausage and a sprinkle of smoked cheese. Mulay’s Sausages are available nationwide at finer food markets and may be ordered for shipment directly from their website. every time I come to your blog, I get hungry! 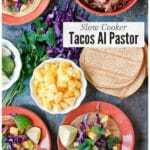 I love how created such a flavorful and easy dish and your breakfast tacos would make a delicious dinner too! That is a fun way to change up breakfast. Pretty sure i’d get no complaints over here! Wow, I haven’t tried something like that. I will try it, we have some sausages in our fridge. Hello! These are awesome! My husband loves sausage and especially new recipes. Sharing with family! Tacos go over really well in our house. Never tried them for breakfast though! The kids will be happy tomorrow! I can’t wait to try this recipe. For some reason, I’ve never thought about making breakfast tacos. It’s a tasty way to start the day with all-important protein. This is a great idea! I’ve been racking my brain to come up with ideas for breakfast that don’t include McDonalds (my husband’s favorite!). This would be a hit. Yummy! I am all about breakfast and would definitely make this for sure! What a fabulous idea! I would never think to make breakfast tacos! 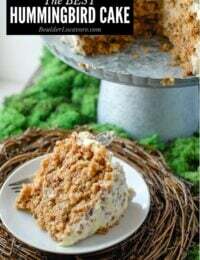 They look and sound just delicious, this would be a huge hit in our family! Oh this looks sooooo delicious! 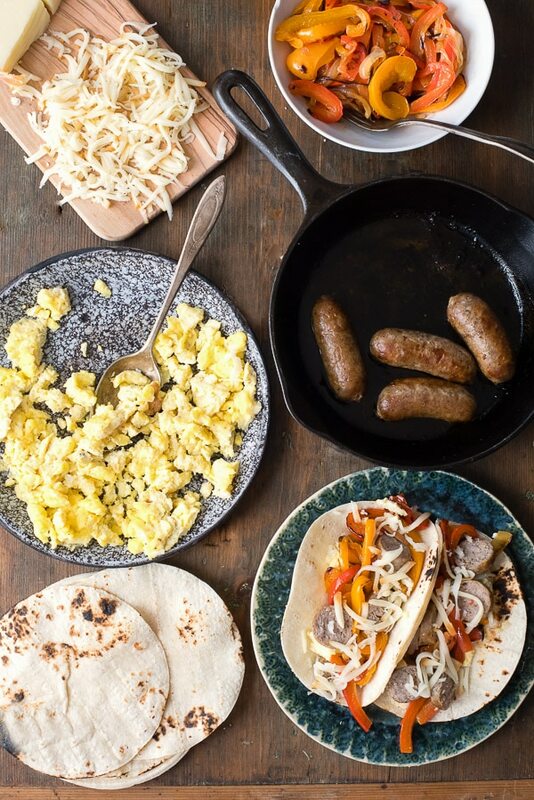 The sausage and eggs in a corn tortilla shell, definitely a perfect way to start the day. My sons will love this, they’re into anything that says tacos, nachos, burgers, or pizza! And having these for breakfast will definitely make them happy! I would love to cook this for them one of these days. Oh wow, my family would definitely like a breakfast like this. I need to try making some of these with my boyfriend! Yes please! Of course you had me at tacos, but I really love the idea of putting a breakfast spin on such a classic recipe. That looks so good! A breakfast taco sounds like such a fun way to start your morning! These sound so yummy! I love the combination of flavors. This would be perfect for a yummy weekend breakfast! We love breakfast tacos. 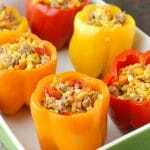 My husband is the sausage and pepper eater here, so I know he would devour these! That looks incredible! This is such a great power breakfast, and it’s so full of flavor. Thanks!